In the race to satisfy the global demand for telecommunications bandwidth, the need for technically advanced, high-capacity networks is paramount. Since 1998, the world has relied on Corning® LEAF® optical fiber to transmit information at higher bit rates and over longer distances than ever before. Telecommunications networks require high capacity and broad system flexibility in order to compete today and to meet the challenges of tomorrow. The technological strength of Corning LEAF optical fiber provides an advanced foundation for today’s sophisticated networks and those of the future. 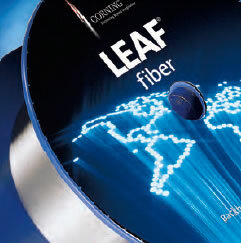 With more NZ-DSF in the ground than any other fiber manufacturer in the world, Corning and Corning LEAF fiber set the standard for long-haul networks. Corning places a strong emphasis on system performance and is committed to delivering products that enable superior networks now and in the future. This commitment has led system manufacturers to develop design rules optimized specifically for LEAF fiber. Low-water-peak attenuation, exceptional transmission capability, moderate dispersion, outstanding geometry, large Aeff and unique fiber characteristics give LEAF fiber the advanced functionality and quality required to enable 10 Gb/s, Raman and 40 Gb/s networks. LEAF fiber’s characteristics also enable extended transmission reach in analog CATV networks. Over the years, Corning has adapted its fiber product offerings in conjunction with evolving market needs and industry trends. In addition to being the lowest cost-per-bit solution in digital networks, LEAF fiber now provides this same advantage to analog networks. This capability is enabled by LEAF fiber characteristics that allow for a higher stimulated Brillioun scattering (SBS) threshold than standard single-mode fiber and other ITU-T G.655 fibers with smaller effective area. The SBS threshold is commonly approached in applications such as analog video transmission. In these applications, LEAF fiber’s elevated SBS threshold enables higher relative optical powers. Along with the higher SBS, LEAF fiber’s low chromatic dispersion in the C-band mitigates analog signal intermodulation distortions and eases the requirements on emerging digital baseband applications. This combination allows LEAF fiber to support longer distances, improved signal quality and higher signal distribution densities.